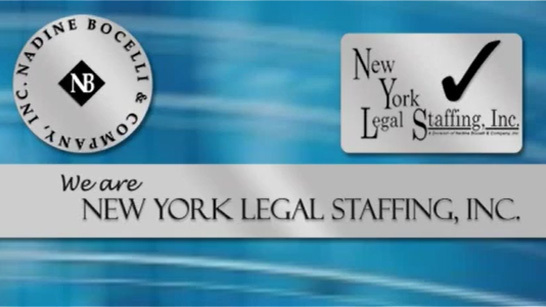 Current Openings – Nadine Bocelli & Company, Inc. – New York Legal Staffing, Inc.
We are located in New York City serving the Greater New York, New Jersey and Connecticut area. We list legal job listings for attorneys, paralegals/legal assistants, litigation support, information systems, legal management, marketing, managing clerks, legal secretarial, legal word processing, billing, accounting, legal receptionist and clerical legal support jobs currently available. Our legal staffing service has employment opportunities for immediate application posted on our legal job board candidate career center. In this current economy, our roster of law firms and in-house legal department corporation clients are still seeking to hire temp, temp-to-hire and direct hire legal employees for select opportunities. These employer job listings are listed by category to help you find your ideal legal job in today’s employment market. The recruitment categories allow you to search quicker and more effectively than a full-text search.